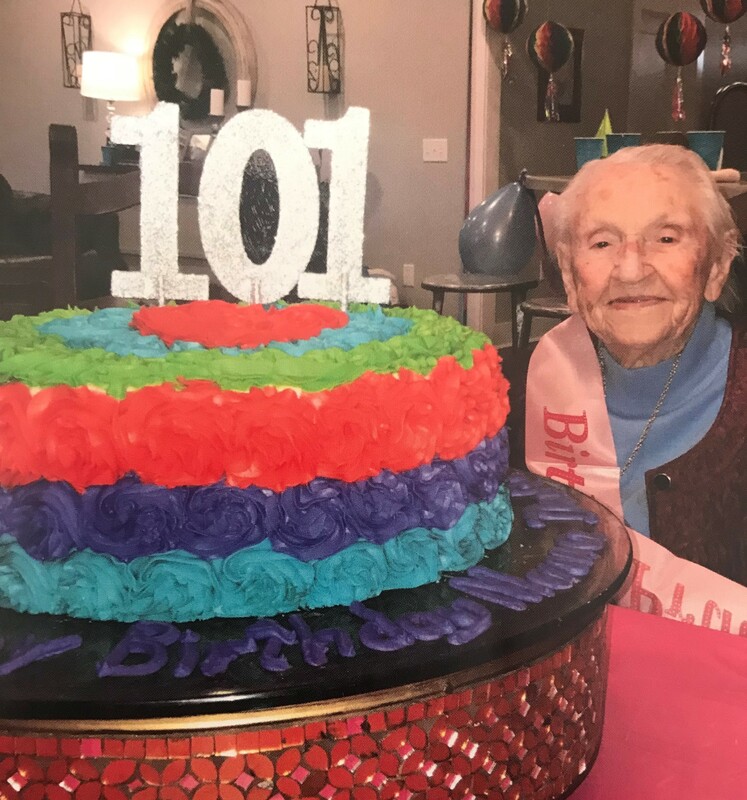 Ruth Harris Duke recently celebrated her 101st birthday with family and friends. She was born in Welti on Dec. 12, 1917 and has lived in or near the community her entire life. Ruth’s father was just 12 years old when he moved to Welti. His was among six families who came by wagon from Georgia to settle Welti in 1904. He came with his parents and his grandparents, Sam and Lucy Harris. Sam and Lucy bought three tracts of land totaling 720 acres and began farming. World War I was nearing its end when Ruth was born. There was snow on the ground causing the doctor to have to walk to the Harris’s home. According to Ruth, snow was still on the ground two weeks later when her daddy traveled to Georgia. The trip brought good news, as Ruth’s father learned he would not be drafted. Ruth and her six siblings grew up on their parent’s farm and they worked very hard. Sometimes they would work the fields for other farmers and were paid 75 cents a day. Ruth also attended Welti School through the ninth grade. Her father needed the kids to help on the farm and didn’t think he could afford for them to take the bus to Fairview to finish high school. Despite all the work, the kids did find time for some fun. They enjoyed candy pulling, singings and board games. Ruth spoke about her mother and how she was in charge of doctoring the kids. Overall, the Harris clan was healthy and only experienced ailments such as the mumps, measles and colds. Her mother was a big believer in castor oil. Without hesitation, Ruth chose the 4th of July as her favorite holiday. She said, “A clan of about 8-10 families would go to the river for usually two nights. We would play in the water up to our knees. There was a coal mine down there and we would get the water from the mine. The water was cooler. We would make lemonade with the water from the coal mine in a new wash tub. You see, we didn’t have ice back then and didn’t until we had electricity. I was nearly grown before I ever tasted iced tea. I thought it was terrible. I didn’t like it but I do now. Christmas was also a fun time for the Ruth and her siblings. She said, “As long as I stayed at home, we always had Santa Claus. Of course, we knew what it really was, but we still waited and didn’t want our presents until Christmas morning. Most of the time we got some clothing and then a toy. We didn’t have a fireplace but we had a heater. Momma would line up the chairs and put each child’s gifts in their chairs. It wasn’t much. A book or a toy, but our toys weren’t expensive. The Harris Family Farm produced almost everything the family would need. The rolling salesman came by and they could get some necessities, but from time to time, they would need to make a trip to town. They also repurposed feed sack and other sacks to make clothes and other household linens. Times were hard for the Harris family, especially during the Great Depression. The car wasn’t the only possession the Harris Family worried about losing. As the Great Depression continued into the late 1930s, Ruth was in her late teens. She enjoyed going to the area singings at the local churches. She met a tall redhead named Hanley Duke. Hanley and Ruth dated for one-and-a-half years before marrying in 1938. She was 21 years old and Hanley was 24.